In the bad old days of media before the computer and Internet, the value of a newspaper, publisher, movie studio or television network was determined largely by the value of the infrastructure that it controlled. Printing presses and trucks for distribution of newspapers are expensive, as are movie and television studios. The value of content was never much thought about other than gross measurements of books, seats or advertisements sold. The public was expected to passively absorb whatever was provided and not interact at all. Oh sure, you could visit the arcades and play pinball, but apart from being unsavory places, the games only allowed very limited control over the play and it was always you against the machine. Then, in 1971, the first video arcade game made its appearance, Computer Space, a derivative of Spacewar, which had become popular among geeks playing on mini-computers at work. The distributors of pinball machines, Mafia types, were not much interested and allowed as how the entire video game fad would pass very soon. 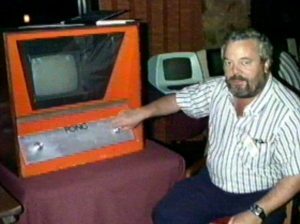 Nolan Bushnell, founder of Atari, assigned a new programmer, Allan Alcorn, the task of developing a prototype tennis game as a training exercise. Working with transistor-transistor logic, Allan added some play value and sound effects and built the first Pong console. In August 1972, it was installed in a local bar. A week or so later, Bushnell headed east to try and license the game to Midway and/or Bally. Before he got there, Alcorn got a call from the bar owner telling him the machine was broken, please come and take it away. 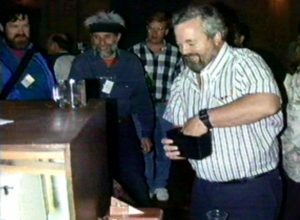 When he arrived at the bar, Allan discovered that the machine was not working because the coin box was stuffed to overflowing with quarters, the last one sticking part way out of the coin slot. After a phone call from Alcorn, Bushnell convinced his clients that the game was not very interesting and discouraged them from licensing it. Returning to California, he first struggled to find financing, then found that they could not expand manufacturing fast enough to keep up with demand. Meanwhile, back in New Hampshire, Ralph Baer, a visionary who in 1951 invented the idea of playing games on TV and later patented most of the basic features of video games, had an exclusive contract with Magnavox, leading to Odessey, the first home computer game. However, before the slow moving Magnavox could respond to the market, dozens of West Coast knock-offs and newer video games were flooding the market. 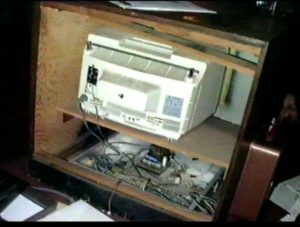 Later in his life, Ralph received awards from IEEE and a National Medal of Technology from, ironically, George W. Bush. But all the money was made by the wild and crazy innovators and venture capitalists in the Silicon Valley. What does this tell us about infonomics? The value of video games was not in the hardware, but in the interaction with information that they facilitated. Is the economic value of information itself, not the infrastructure to deliver it, the driver of innovation? Have publishers learned anything since 1971? Has the Internet decoupled information from infrastructure? Is this decoupling a major step in the evolution of life? Does life include both human and technical life forms? Is there a universal driver of evolution? “I’m sorry-ory Mr. Ah-Clem, your questions-estions are making-aking the Doctor unhappy-appy. You have violated Robots Rules of Order and will be asked to leave the future immediately.” – Firesign Theater, I Think We’re All Bozos On This Bus.